WHAT’S GOING ON? The Westchester Community College (WCC) Foundation has invited Henry Kissinger to speak on ways to promote “global order and international harmony” at a campus forum on Sunday, November 15, for $100 a ticket and up. In fact, his life and work is a stunning example of how to promote global disorder by instigating aggressive military and covert operations, and providing military and police aid to tyrannical governments – often flouting both U.S. and international law – and get away with it. JOIN US! If you care about peace, human rights, and democracy, please join our vigil to hold Henry Kissinger accountable, and educate the public about the need for ethical and responsible U.S. foreign policies that encourage diplomacy, prevent wars, and promote respect for human rights. WCC Foundation: Please Do Your Homework Before You Schedule a Panel Discussion! The WCC Foundation’s “President’s Forum” with its “Catered Dinner and Dessert Reception,” dishonors the lives and memories of millions of people around the globe – Vietnamese, Cambodians, Laotians, Chileans, East Timorese, and so many others — who were bombed, strafed, napalmed, maimed, shot, displaced, kidnapped, jailed, interrogated, tortured and/or exiled — as a result of US military campaigns, covert operations, and arms transfers directed and authorized by Henry Kissinger. 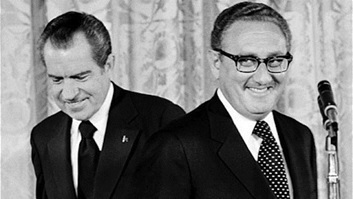 VIETNAM: Kissinger scuttled peace talks in 1968, paving the way for Richard Nixon’s victory in the presidential race. Half the battle deaths in Vietnam took place between 1968 and 1972, not to mention the millions of civilians throughout Indochina who were killed. CAMBODIA and LAOS: Kissinger persuaded Nixon to widen the war with massive bombing of Cambodia and Laos. By conservative estimates, the U.S. killed 600,000 civilians in Cambodia and another 350,000 in Laos. EAST TIMOR: In 1975 President Ford and Secretary of State Kissinger met with Indonesia’s corrupt strongman Suharto and gave him the go ahead to invade East Timor. Kissinger told reporters the U.S. wouldn’t recognize the East Timor, which had recently declared independence from Indonesia. Within hours Suharto launched an invasion, killing, by some estimates, 200,000 civilians.